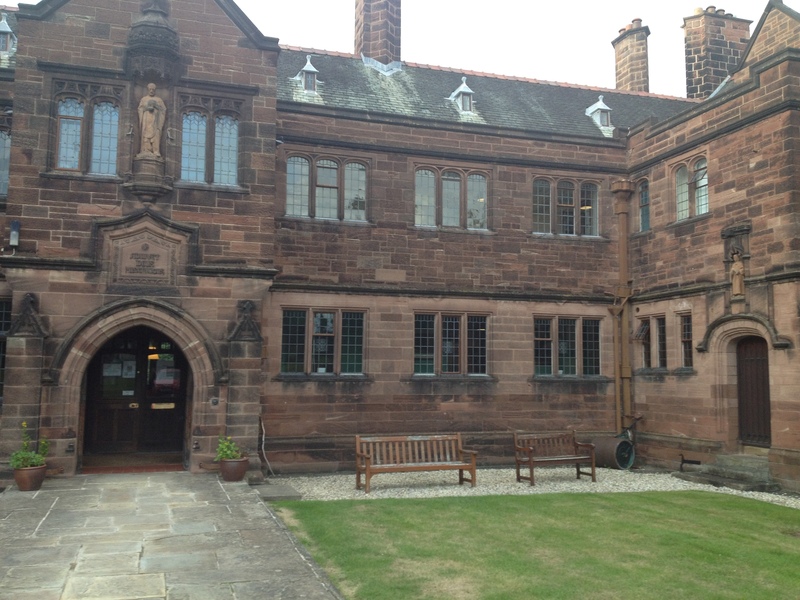 I attended the book launch on Tuesday evening of Martin Edwards’s new book, The Frozen Shroud, at Gladstone Library on the Welsh border near Chester. The library is, in my opinion, one of the hidden treasures of the region. It was founded by William Gladstone to house his personal collection of books and the building was erected to replace the temporary structure in 1902. It’s a fabulously atmospheric place that holds residential courses and a variety events at a very low cost. I’d recommend checking out their website here. 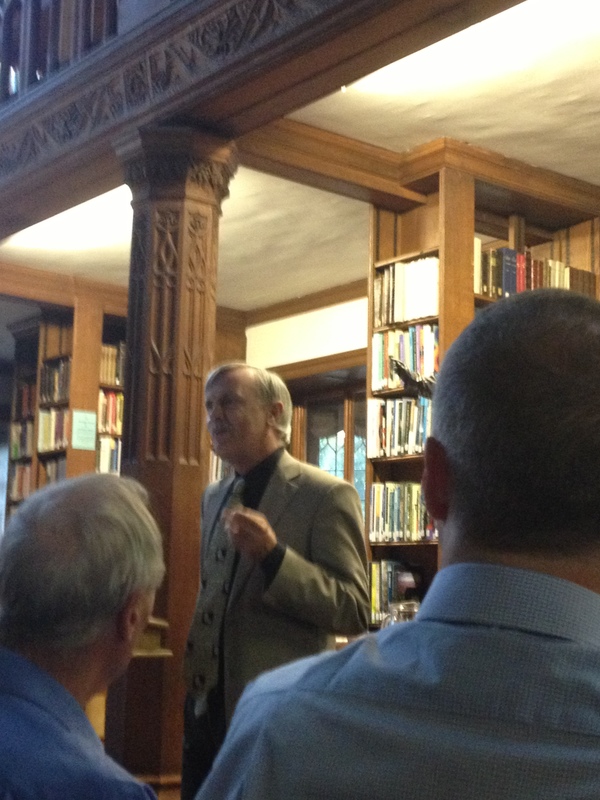 Martin’s book launch took place in the main library room which was a perfect setting for a reading and discussion. Martin’s account of the event is on his own website. He rightly describes it as an evening to remember. This is where I have to make a confession to make. Despite being a regular visitor to Martin’s blog, I’ve never read any of his books, an omission that I was keen to remedy. The Frozen Shroud is the latest in his Lake District series featuring DCI Hannah Scarlett, head of the Cold Case Review Team and Daniel Kind, a specialist in the history of murder. Ravenbank, a remote village in the Lakes, is fascinated by the story of a young housemaid who was found killed in a nearby lane, the victim of a jealous rage. In a strange twist, her face had been removed by the killer and a frozen shroud clung to her remains. History repeats itself years later with the murder of Shenagh Moss, the girlfriend of a local landowner, although the culprit in soon identified. Five years later a new murder is committed and all three killings are re-examined. The b ook opens with the second murder and sets the scene for the rest of the book. We get a strong sense of a small community in the Lake District where disparate people are thrown together by an isolated location and shared history. The countryside appears both familiar and frightening, there is clearly a hidden menace lurking closer to home than the community realises. Hannah Scarlett is an interesting protagonist. As I haven’t read any other of the previous books, I’ve clearly missed a significant amount of character development but it’s easy to piece together the background of both Hannah and Daniel. Hannah is reassuringly vulnerable. She makes poor decisions in relation to her personal life which gives her character depth. Her friendship with Daniel is still tentative and based more on mutual admiration than anything substantial at this stage although, based on comments by the author, the relationship promises to head towards something more significant. It was a bold move by the writer to bring three plot strands together, all of which involve a similar style murder. In fact it worked very well as all three murdered women had distinct personalities. 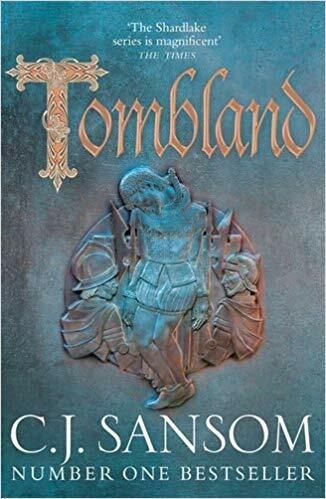 For those, like me, who are new to Edwards’ work, Frozen Shroud is an excellent introduction and I’ll definitely be reading more of this series. His existing fans, I’m sure, will love it. As an aside, as I mentioned at the beginning, Martin is a very active blogger. One supporter of this website, Margot Kinberg at Confessions of Mystery Novelist has long been a champion of this author’s books and was one of the reasons I was so keen to read him. In his acknowledgements, Martin also thanks two Australian blogging friends, Kerrie at Mysteries in Paradise and Bernadette at Reactions to Reading, for help given. Do check out all these websites, including Martin’s – the crime fiction blogging network is alive and flourishing. Sarah – Thanks very much for the kind mention. And I’m so glad that you enjoyed your first Martin Edwards book. This is a terrific series I think, and I hope you’ll get the chance to read others in it. One of the things you bring up is the way Edwards draws plot threads together. He does that quite effectively I think, and follows each thread quite well as he does so. That and the past/present connections are what got me interested in the novels in the first place. The characters are a part of what has kept me a fan. Sarah, what a fascinating place for a book launch! Thanks for sharing the event. I recently read and reviewed my first book by Martin Edwards which happened to be his first book too — “All the Lonely People” — and I liked it a lot. First of the Harry Devlin series, the Liverpool attorney’s characterisation is entirely believable. I hope to read more books in this as well as his Lake District series. Thanks Prashant. I’m off to look at your review now. And yes, a wonderful place for a book launch. I really enjoy novels that are character strong and this sounds an interesting one. Thank you. It’s an excellent blog. And thanks for the link. I’ve never heard of the Gladstone library but have just immersed myself in their events calendar and there are two or three things that sound really interesting. Martin Edwards is also a new name to me, I must add his blog to my reader. Great news, Marie. It would be lovely to meet you at one of these events. And I’ll look forward to hearing what you think of the book…..
I’ve enjoyed the first two in the series, and Martin Edwards’ blog is on my reader – he often offers reviews of lost crime titles, which I do like, as a fan of the ‘classics’. . Thanks vicki. I love classic crime too! I bought The Frozen Shroud for my Nook several months ago and am looking forward to it. I like Martin Edwards’ style and love the setting. I’m glad I have it to look forward to and thank you for writing about him and the book. Thanks Judith and I’m glad that you are a fan of this writer. I’ll look forward to your review. I’ve been fascinated by the Gladstone Library since I first heard of it, and hope to visit there one day. I very much enjoyed the previous Martin Edwards book, set in a fictional version of the library, and hope to get to this new one soon. Thanks Moira. I had never heard of the Gladstone library until the book launch but it really is an amazing place. One of the north west’s hidden gems.